Ghatotkacha was the son of Pandava Bhima and his wife Hidimbi. Hidimbi, a Rakshasi, had magical powers. And her son Ghatothkach inherited all the magical powers of his mother and the strength of his father Bhima, the second among the Pandavas. Meaning of Ghatotkach - He had a pitcher-like head (ghat means pitcher). He had no hair (kach) on his head. So he was called Ghatokach. Hidimbi ruled over the forest and later when Ghatotkach grew up he became the ruler of the forest. During the Kurukshetra war in the Mahabharata, Ghatotkach proved to be one of the greatest warriors. He created havoc in the Kaurava camp. It is said that he would have single handedly won the war for the Pandavas. During the night battle after the death of Jayadratha, Ghatotkacha created maximum destruction on the Kaurava side. Finally, Karna used the Vaijayanti Shakti, a powerful spear, to kill Ghatotkacha. The spear could only be used once. Karna had saved it to kill Arjuna. After being struck by spear, Ghatotkach increased his size. Those who witnessed it felt as if he touched the sky. He then fell on the Kaurava army crushing thousands of soldiers, horses, chariots and elephants under him. It is said that a third of the army of the Kauravas was destroyed by Ghatotkach. Thus Ghatotkacha died a hero’s death in the Kurukshetra war. If any of the Pandavas remembered him he would immediately come to their help. He once bore Draupadi on his back to the Gandhamadana mountain. 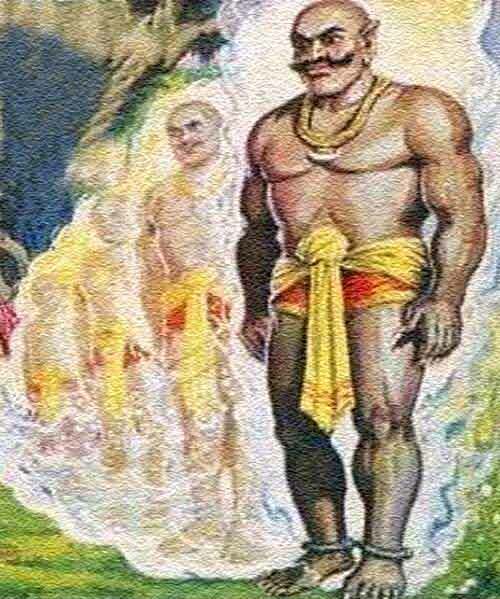 Mauravi was the wife of Ghatotkach and they had a son named Barbareek. Ghatotkach is worshipped as a village god in some villages in Kullu in Himachal Pradesh. He is believed to have been born in Ghatochi Cave, situated near Kunihar. Dimasa are the earliest known inhabitants of the Assam Valley and claim their descent from Ghatotkach, the son of Bhima, the hero of Mahabharata. Barbareek was the son of Ghatotkach and he sacrificed himself for the victory of Pandavas. His severed head watched the Kurukshetra battle from a hill.